I am a digital native. This may seem surprising since I was born in 1967. But I am the child of an electrical engineer who was an early adopter. Since he was buying computers early and often there was always some lesser machine rolling off the bottom of the stack for me. In 1983 I was the only kid in my high school with a computer. I was the copy editor of my high school yearbook. When all the other high schools were typing their copy on triplicate forms with typewriters, I figured out how to feed the forms through my daisy wheel printer and wrote the whole yearbook in a word processor. This is to say I think in computer. When I want to take notes I reach for my iPad or phone. It never even occurs to me to reach for a pencil and paper. When I started knitting I kept notes in the aptly named Notes app. (Notes is especially good since the iOS 9 update because you can take pictures right in the middle of your note taking.) When I realized I was obsessed with knitting I started researching databases. I loved Filemaker Pro when I was an engineering consultant. The power of a database is compelling to me. I wanted the ability to design records with different kinds of data fields. But Filemaker Pro is way too expensive for me. I ended up buying an iPad app called Boximize. (It doesn't have a counterpoint for the Mac, which is a drawback. It also deletes everything you just typed into it if you callously go to another app. It's like the olden days when you had to actually hit Save. Only there is no Save in the app. You have to back out of what you're doing with Done. I keep thinking they'll fix their autosave in a future update.) I will discuss Boximize as a knitting app in another post. What I want to talk about today is Numbers, the spreadsheet that comes standard on all iPads and Macs. While a database is what I need for all the assorted information about each design, like the yarn and needles I used, final size and weight, photos of critical parts of the process to refer to later, a spreadsheet is what I want for the actual pattern. Especially a spreadsheet on iCloud that syncs automatically between my computer and my iPad. I often download a PDF of a pattern online, select all the text, and paste it into Numbers. Then I edit it into row-by-row instructions. I may duplicate the pattern into multiple sheets and delete the stitch count for all but one size. Once I have all this organized on my computer I can go anywhere with my knitting and use my iPad as a checklist. 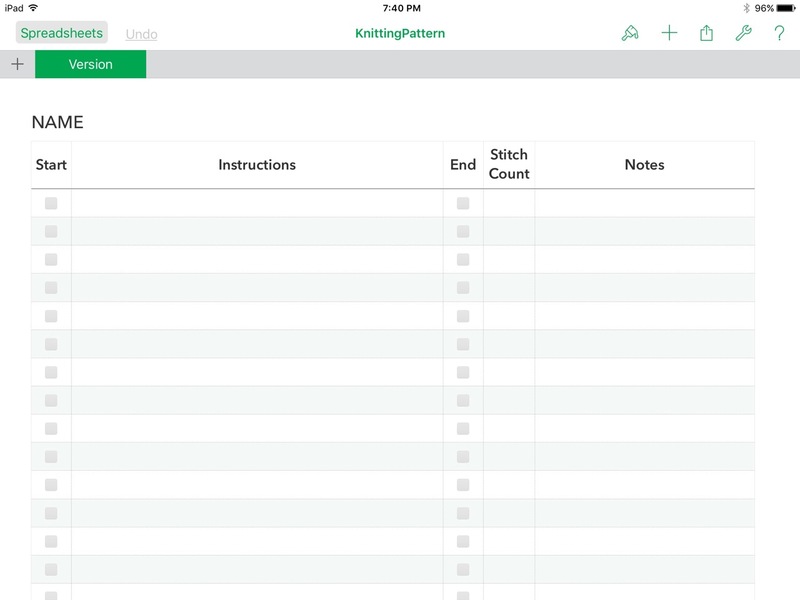 I can add notes on a row-by-row basis in the spreadsheet on my iPad. If I use the same pattern again I add a column and make a separate set of notes for the next time I make it. Then eventually I may duplicate it to a new sheet, change the version number and revise the whole pattern if I come up with a better way of doing it. You can do all this directly on your iPad but it's kind of frustrating. I clicked all around on it and couldn't figure out how to save a file as a template. But you can do it on your Mac and save it to the iPad to use it. 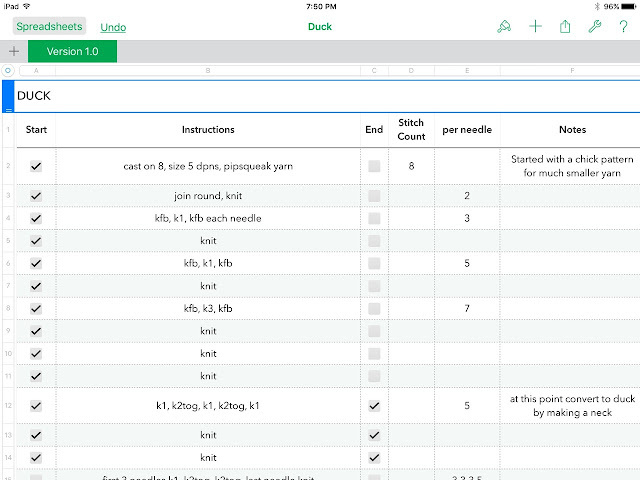 Here is my standard Numbers template for a knitting pattern, as seen in a screen shot of my iPad. Here's how to create this knitting pattern template for Numbers on your Mac. Open Numbers by clicking the bar graph in the Dock or find it in the Applications Folder in Finder. File: New — Choose a Template should come up. I started with Basic Checklist. Click that choice and then Choose in the bottom right of the box. I duplicated the checklist column because I kept forgetting if I checked it before or after knitting the row. If I have a box to check for both I know where I am when I pick it up again. If they are both checked I stopped at the end of the row. To duplicate a column select the letter at the top. Copy it (command C), select the C column and right click (two finger tap on track pad, control click for one button mouse) Select Add Column Before. Paste into the new column. Select Column D now and add another column before it for the stitch count. Resize your columns. You can select all of them and hover over the line between letters until the cursor has two arrows sticking out. Double click. This makes them all very small. Now stretch out Instructions and Notes to fill the window the way you like it. Select the column and hover over the line to get the cursor to change to two arrows. Click and drag to size. Add more rows to your spreadsheet by grabbing the = at the bottom and dragging it down. How to get this on your iPad? Save the file as Knitting Pattern. Open Numbers on your iPad. (If it's not there go download it from the App Store.) When you see the list of spreadsheets you'll see your Knitting Pattern file. Select it. You'll get a dialog box asking Add to Template Chooser? You'll be able to use this template to create new Numbers spreadsheets. Click Add. Now your creation is available on your iPad too. Now when you go to File: New you can select My Templates and see your empty pattern. Or just scroll down and it's at the end of all the stock ones. If you download a PDF of a knitting pattern or see one on a blog you'd like to try you can select the text, copy it, go to your new file made with your template, select the top cell in the Instructions column, and paste. Try it with the numbered list above. It will put each paragraph in a cell of the spreadsheet. Now you can make your own notes for each step, delete sizes you aren't using, type the stitch count into its own column, and more. Whenever a pattern says Rows (17-28) or something like that I carefully expand that to the right number of rows to check off. 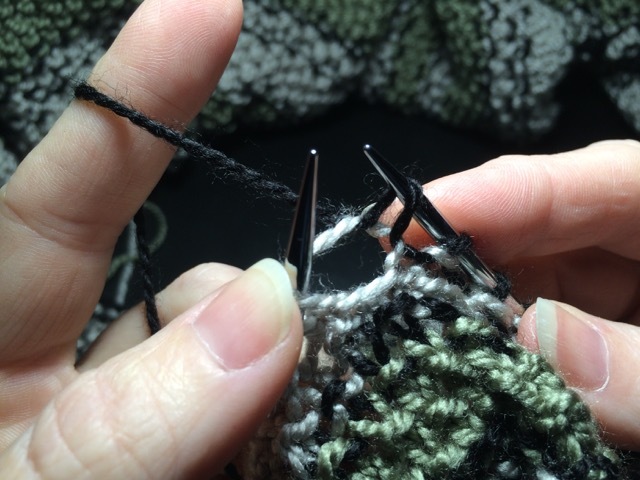 For patterns on double pointed needles I often add columns to keep track of how many stitches are on each needle. Or if I have a hat with a lot of markers I'll track stitches between markers in another column. If I am designing a hat and want to see if the number of stitches are going to come out I use formulas to calculate the stitch count for me. Spreadsheets are so handy! Here's an example of a spreadsheet I worked on today while I was making a duck. This is an example of how sloppy you can be if you want. Just because it's a spreadsheet doesn't mean you have to make it feel like work. I am not really OCD about the checkboxes or stitch count when I'm making it up as I go. Precise row counts and stitch counts are more important when I'm doing a second of something, like a foot, to be sure they match. (Feet go from row 80 to 113, not seen in this example.) I try to jot down just enough that if I like how it turns out I can do it again, filling out the instructions to be more clear. The duck was way too hard. I'm not going to try to make this into a reproducible pattern. 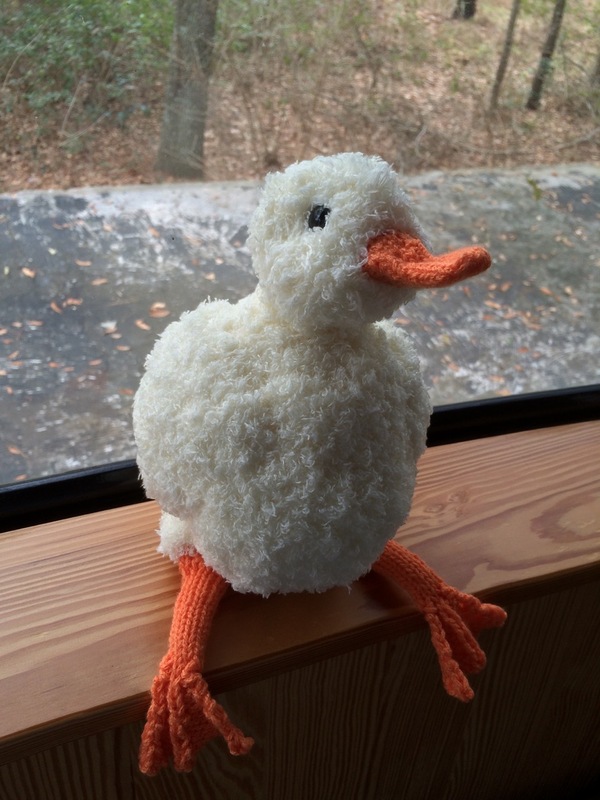 Also that yarn from the fabric store had such a strong smell it gave me a migraine for the two days it took me to make this duck. You'd think I would learn. There is also Continental and English knitting (aka American). English knitting is called throwing the yarn while Continental is considered to be picking the yarn. YouTube doesn't make a distinction though. You have to know what you're looking at when you see it. My grandmother knit continental and I have no idea why. My family is just as English as can be. Maybe she had a German governess? My aunt says we will never know. All I know is that as a baby I loved how my grandmother's hands flashed and the needles clicked. I made her show me how to do that. I learned and it stuck. When I picked up needles over 40 years later the muscle memory was still there. What ultimately determines how much you enjoy your knitting is how much it makes your hands hurt and how does it look when you finish. While throwing or picking the yarn won't matter to the finished product, how MUCH yarn you throw or pick will. 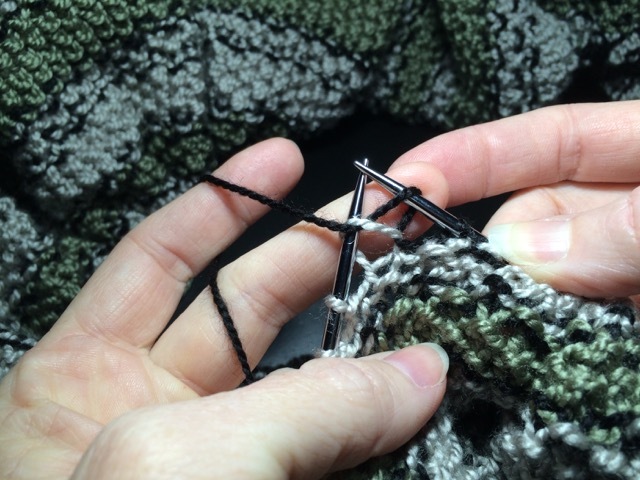 Meaning it's important to keep the same tension for purl and knit stitches. This is why I knit combination. It's always an underhand motion of the needle to pull the yarn through the stitch. Lots of blogs address what to do about something called "rowing out." 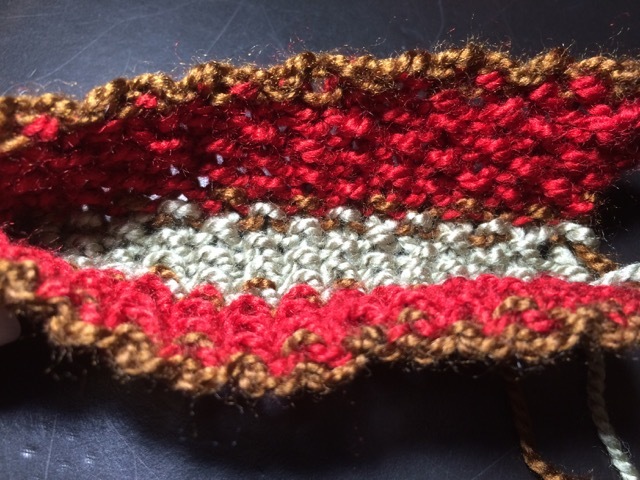 This is when straight knitting looks lumpy because purl stitches put more yarn in every other row than knit stitches when it's done the "correct" way. Combination is a more balanced way of doling out the yarn. 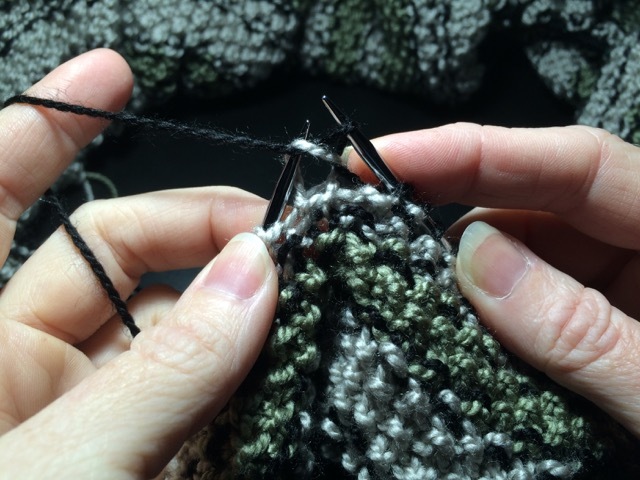 Also in "correct" knitting the purl stitch is wrapped the opposite way of the knit. 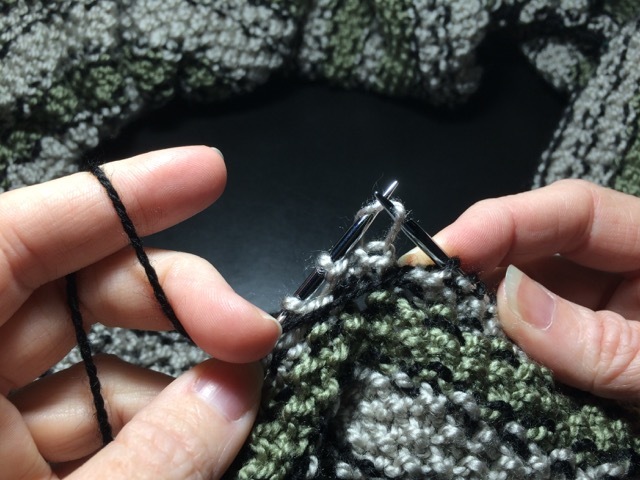 A lot of people find this difficult and sort of hate to purl. In combination you wrap the yarn the easy way all the time. 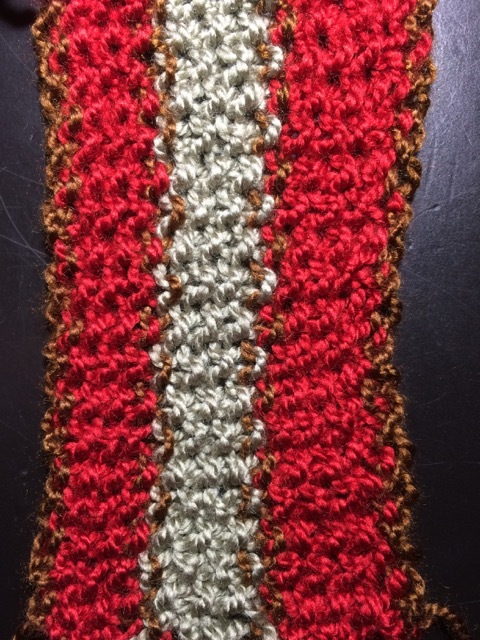 Here's a GIF with a knit stitch (on the front of the work) and a purl stitch (on the back of the work) mashed together and put on repeat. I slowed down the needle scooping the yarn to try to emphasize how it's the same motion. The knit side of the fabric is the smooth side that flips to the front. The purl side is the bumpy side that flips into shadow. Knit in back. Purl in front. Purling underhand puts the working leg of yarn in the back when you turn the work to knit the other side. It also means both sides take the same amount of yarn and they are more likely to come out even. Most patterns are written for Western style. If it's all garter stitch then everything still works for Combination. If you never purl then the working leg is always in the front and you knit just like Western knitters. You only knit into the back leg of the stitch if you purled it from the other side. If you are knitting stockinette in the round you always knit in the front leg of the stitch. To transpose Western patterns to Combination learn to read and feel your knitting to know which leg of the stitch to work. Once you know that they expect the front leg to always be the working leg you can do any increase or decrease that contains a stitch purled on the last row by simply flipping the stitch on the left needle to the Western orientation before you work it. This is relevant for slip-slip-knit (SSK) and knit 2 together (k2tog) as well as for knitting through the back loop (ktbl). Purl 2 together on the purl side of stockinette, no change necessary. I'll do a post on all this later. Note on Fisherman's Rib video link (Illustration for Eastern Style above): Fisherman's rib is one of the first things I knit because I loved how the video presenter said "knit one below." I never really figured out how she was wrapping the yarn (Eastern Style) so I kind of just did it by feel. I am sure I was getting my stitches twisted all kind of the wrong way. But by knitting in the stitch below on the next row the stitch orientation on the needle is totally irrelevant. 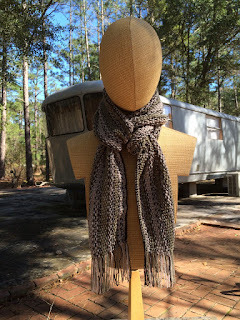 You can wrap the yarn any which way with fisherman's rib and it comes out the same. I even knit a cowl in fisherman's rib in the round on circular needles where every other row you have to purl instead of knit, purling the wrong way without knowing it. But in that stitch pattern the whole front leg/back leg thing doesn't even matter. You work the one below the stitch you twisted on the last row. The twist untwists itself as it falls down over the stitch making the fabric extra thick. 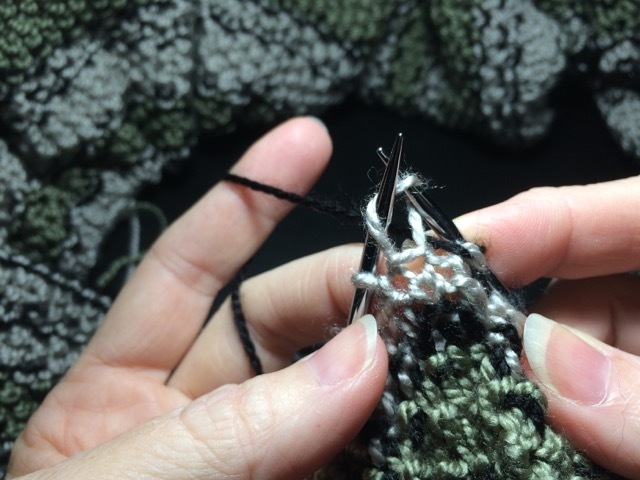 It was while doing a long scarf in fisherman's rib I got muscle memory for purling underhand. Then I had to do more research to figure out what was going on. I was happy to learn that combination knitting had a name and even a few YouTubers. My maternal grandmother taught me to knit when I was just a baby, sometime around 1970. She was a continental knitter (this means she held the yarn in her left hand and snagged it with the right needle.) I loved how her hands flashed too fast to even see what she was doing. The sound of her anodized aluminum needles was fascinating to me. I made her teach me how to knit against her will. Or at least that's how my aunt remembers it. I can only remember sitting on the sofa in the living room of the ancestral home with some hideous green acrylic yarn knitting a scarf for my cousin who lived in Montana. (In Beachton, Georgia the average low is 40°F in January, the coldest month of the year.) I ran out of yarn in time for Christmas and my grandmother bound off for me and I sort of gave up knitting. 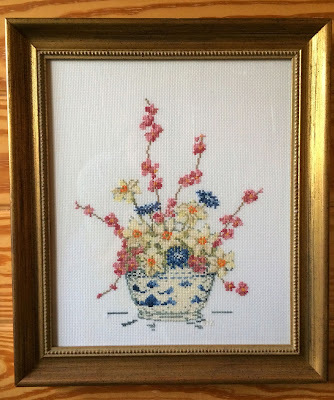 Soon I took up counted cross stitch instead because I liked all the different colors and designs. I took up knitting again in 2014 when I saw boot cuffs on Etsy and wanted some. I discovered YouTube videos that show you how to knit. The boot cuffs totally didn't work for me. I took a selfie of my first attempt and texted it to my college age niece. She nixed my fashion choice unequivocally. But by the time I realized it was a failure I was too curious to stop. 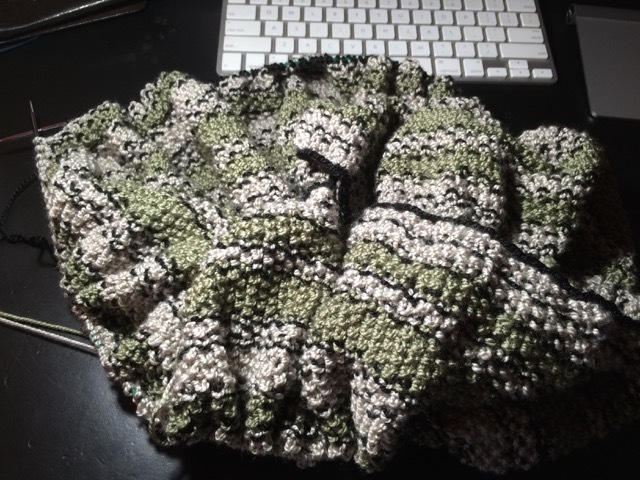 The more I learned about knitting the more questions I had. Now I'm basically obsessed. I can't see a thing without wondering how I would knit that. 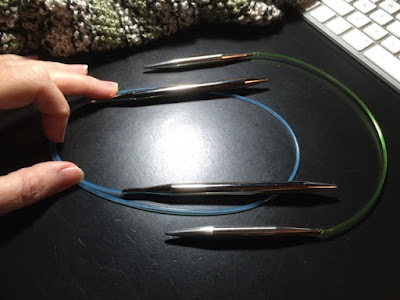 When I was first learning again I saw a video that explained some of the most common problems for beginning knitters, such as picking up the needles in the wrong hands and knitting back the wrong way. I realized immediately what I did wrong as an infant that made that green scarf have all those button holes. And I understood why it mysteriously got wider in the middle. And I appreciated how my grandmother returned it to the right width and let me keep going with the idea I made it like that on purpose to work like a hood. I knit full time now, for a living. I knit things based on ideas I want to try. I let people buy what I make because I need money buy yarn and needles. And also because some of the most fun-to-knit yarn is completely itchy to me. I can't wear any animal fibers. I'm straight up allergic to lanolin. I have a chemical sensitivity type reaction to the smell of the fabric store on cheap acrylic yarn. But if I order yarn online it is less likely to have an offensive odor. I can even knit with wool if it is the extra fine merino superwash kind with all the lanolin taken out of it. I need to figure out how to make more money with knitting so I can not only buy yarn, but also pay my bills. Selling patterns, products, teaching? I don't know. I did a lot of commissions last Christmas. I liked collecting the money for the yarn up front. I have learned to that put anything online is like pulling your boat up alongside the black schooner flying the skull and crossbones and volunteering to come aboard and scrub their deck and fix them all sandwiches. There is absolutely nothing in it for me and a lot in it for the online pirates. My other blog has been completely scraped and reposted with ads on it, things I have written have been plagiarized, my videos have been stolen and reposted with ads or put into compilation videos edited for a fee. This bothers me. My instinct is to retreat and not give away things other people will take to make money for themselves. But at the same time I like to share things I learn. I wouldn't be doing this at all if it weren't for others giving away their knowledge for free. I am not sure what I will do, but if I figure it out you will see it here.